Safety is important whether you are day hiking or winter backpacking. Proper planning, preparation, proper clothing and taking appropriate gear along are essential to a safe and enjoyable excursion. The NY DEC has a great pamphlet called Lost in the Woods. Here are some tips from the NY DEC plus CNY Hiking. Before You Leave plan ahead. Learn about the area ahead of time. Study the latest guidebooks and maps that give information on highways, trails, streams and other physical features. Use this website to help plan your trip. Plan your trip carefully according to routes and the time you have available. Check weather reports before you set out. Prepare yourself physically. If your planned recreation calls for considerable physical exertion, get in shape beforehand. Do not attempt a trip that is beyond your physical capabilities. Leave word of your destination and schedule. In order to locate you in an emergency or send assistance should you need it, leave word at home or with a friend as to where you are going and when you intend to return. Know the rules and guidelines for the area you are visiting. Dress appropriately for the season and where appropriate hiking shoes or boots. Layered clothing is best to meet changing weather conditions. If cool or wet conditions can be expected it is recommended that you avoid cotton clothing, which insulates poorly when wet and dries very slowly. 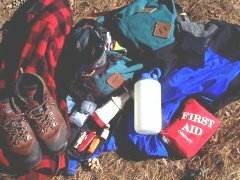 I also carry an extra pair of socks, shirt, gloves and a winter hat in my pack (even in the summer). Gloves can come in handy, even in the summer. Carry a compass and a topographic map of the area. Be sure you know how to use both. If you have a GPS hand held unit, use this also. Remember to set a waypoint where your vehicle is! Take along appropriate equipment and supplies. A day pack containing rain gear, extra warm clothing, high energy food, water, first aid kit, pocket knife, whistle, lighter and matches in a waterproof container are recommended. Sunglasses and insect repellent are also handy. I also carry a bandana, fire starters, Kleenex, toilet paper, emergency blanket and rope. Do not drink water from ponds or streams unless you have treated it first by boiling, filtering or using purification tablets. I believe boiling is the best way. You should sign in at any Department of Environmental Conservation trail register you may pass. This will assist us in finding you should they need to search for you. What food should I bring for my day hike? Bring enough food to hold you over in case you get lost. If you become lost, keep calm, stay dry, keep warm and stay put. If the weather is particularly cold or bad and you must spend the night in the woods, also build a small shelter using dead branches, hemlock boughs and leaves. The shelter will serve as a "cocoon" and should be just big enough for you to lie in comfortably. Set up camp before darkness falls. If you feel you can try and find your way out of the woods, remember that following streams downhill will nearly always lead you back to signs of habitation. Any person knowing you are overdue should contact the New York State Forest Ranger in the area of your trip. In case of accident, at least one person should remain with the injured person. Know and use basic first aid techniques. Others in the group should carefully note the location and contact the local New York State Forest Ranger.